Why do my wisdom teeth need to be removed if they don't bother me? My dentist has suggested that they be removed even though I don't have any discomfort or pain — I didn't even know I had them. What do you think? Two objects cannot occupy the same place. 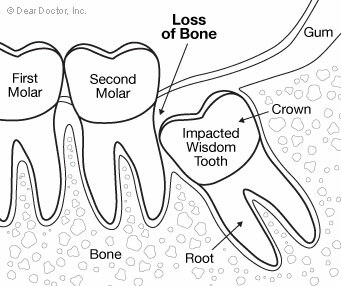 If the wisdom tooth is up against the roots of the second molar, bone cannot cover the root surface as it is intended. Notice the bone that is lost between the second molar and the wisdom teeth. This area is now vulnerable to periodontal disease. Teeth consist of two main parts, the crown and the root. The root is formed in a way that it can exist beneath the gum tissue, long term. The crown, however, is covered by enamel and formed in a manner that should protrude through the gum for predictable health in the mouth. Having the enamel crown trapped below the gum can result in problems like infection, cyst formation, and gum disease. Wisdom teeth (also called third molars) are most often recommended for removal because they become impacted, meaning the teeth are not able to erupt fully through the gums and become healthy, functioning teeth. Teeth normally develop deep in the jaw and during the formation of the crown and root, the tooth pushes its way through the gum into the mouth. Since wisdom teeth naturally develop as the last teeth, the available space for them to emerge through the gum is often already taken up by the teeth that have already erupted. Instead of erupting fully, these teeth run into the roots of teeth already in place. In this way, the teeth become stuck, or impacted, and cannot completely erupt into proper position in the mouth. Having a tooth submerged below the gum, pressing on the roots of the other teeth presents a problem. Having a tooth submerged below the gum, pressing on the roots of the other teeth presents a problem. Damage may occur to the roots of the important, erupted permanent teeth. Development of this damage may occur without any symptoms of pain and can severely compromise the adjacent tooth before anyone discovers what has happened. Timing of wisdom tooth removal is important. The best time to remove a wisdom tooth is when it is not causing problems. This is because by the time the tooth becomes painful, significant damage may already have occurred to the teeth nearby. In addition, the ability of the body to respond well to oral surgery decreases with age. Young, healthy patients, with no prior infections at the site provide the best opportunity for uncomplicated tooth removal. The best time to remove a wisdom tooth is when it is not causing problems. Not all wisdom teeth are the same. This is why the decision to remove wisdom teeth needs to be discussed with the doctor. The potential benefits as compared with the risks must be part of an informed decision by the patient. I hope this gives you some insight into why wisdom teeth are removed. Your general dentist will most often refer you to an oral surgeon to have the teeth removed as well as get his opinion. I'm sure everything will go well.